We’ve been talking a lot about tambour embroidery recently, and since I promised a tutorial for you, here’s a video on the basic stitch! The very best way to get familiar with tambour embroidery is just to do it – that is, sit down with a hook, a piece of fabric in a hoop, and some thread, and try it. Work your way through the basic movements of the stitch, until you understand how it works. Start by stitching in one direction – the direction that’s most comfortable for you – and keep practicing in that direction, until you have the movement of the hook down. From that point, it’s just a matter of practice. And more practice. And even more practice! Practice until you’re comfortable with the hook. Practice until you can stitch in all directions with it. The more you practice, the more the stitch makes sense, and the easier it becomes to stitch in all directions. To get you started, then, I’ve worked up a how-to video for the basic chain stitch with the tambour hook. Before you start, make sure you set up your tambour hook correctly. The knob on the handle and the opening of the hook should both point in same direction. Wherever the knob is, you want to line up the opening of the hook on the same side, right in line with the knob. Why? Because you can’t see the opening of the hook when you work, but you can always see the knob. And you need to know where the opening of the hook is, the whole time you’re working. The knob will tell you! While you practice, develop the necessary habit of entering and exiting the fabric vertically. 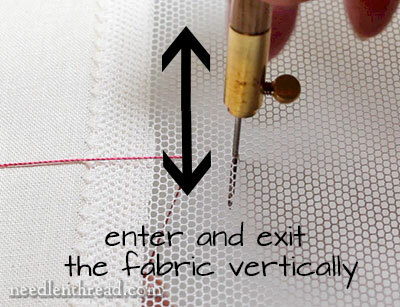 Entering and exiting the fabric at an angle can cause the hook to snag on the fabric. The video below starts with the thread anchored on the side of the fabric. You can anchor the thread different ways – for example, in this article, you can see how I used waste knots to anchor my threads. The video begins somewhat far away from the stitching, and then part way through, I zoom in on the stitch and slow the video down, so you can see the movements of the stitch in slow time. Later on, I’ll share some more tips to help you get comfortable with the tambour hook, including information on how to turn and stitch in the opposite direction, how to stitch sharp corners and points, and so forth. In the meantime, though, if you’re keen to learn how to wield a tambour hook, start by practicing the basic stitch! You can find more information on tambour embroidery in the Tambour Embroidery Index here on Needle ‘n Thread. If you’re looking for other how-to videos for a whole range of hand embroidery stitches, you’ll find plenty of how-to videos for hand embroidery right here on Needle ‘n Thread! Oh this so great I want to start practicing the Tambour stitch now, what a great video you really explain how to embroider the Tambour stitch and the see through fabric is great because you can see what’s going on underneath the fabric. Thank you, thank you for the video, for showing us how it’s done and explaining in such detail how to use the needle. I can’t wait to start. Thanks so much for the video. I really want to try this. I found a tambour hook in a stash my sister gave me. I didn’t know what it was. Boy am I ever ready. Loved all the articles you so generously brought us. You do SO MUCH for the world of embroidery, Mary, and THANK YOU for doing so! I have been talking about wanting to do tambour for so long — bought the books, acquired the tools — NOW I HAVE A “How To” Video! The time is right!! Excellent tutorial. You are very kind to spend the time to do these for us. It is really appreciated. Beautiful netting too. Is it cotton? From Lacis? Again, many thanks for all your efforts. I thank you very much for the tambour embroidery tutorial video! Maybe in the future you would like to introduce some beading techniques with tambour hook too? Wow! Still waiting for my hook to arrive, but my fingers are already itching. It took about 5 weeks of stitching traditional chainstitch to complete the first embroidery. It will be interesting to see how long the second will take using the hook. Thanks for the cool video. In his book on Luneville embroidery, Bruno Faure says that when working from left to right or from top to bottom, you should wrap the thread (and turn the hook) in clockwise direction. When working from right to left, or from bottom to top you turn in anti-clockwise direction. After the stitch is done, the hook is turned forward in the opposite direction (e.g anti-clockwise when working from left to right). Oh, thank you, Mary. Such a very clear video. So helpful. 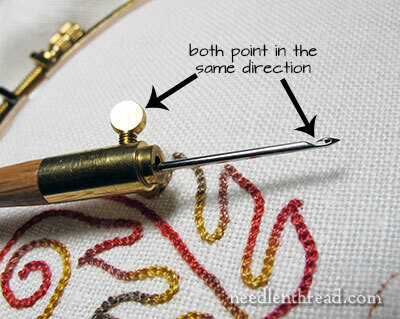 It will make learning this new form of embroidery easy as all your tutorials do! Thank you so much for the video! Your tambour articles have been fascinating from the beginning. I have it on pretty good authority that I will be getting a set of hooks for the holidays. 😉 Can’t wait to give this a go. Amei o seu vídeo! não conhecia o trabalho. Quero fazer o bordado, onde posso comprar a agulha? Agradeço a sua bondade de ensinar com clareza o bordado. Mary, thank you for the awesome video and all the previous posts. I am so,excited to try Tambour Embroidery that I have ordered a loom and coton a broder. The see-through material is great. Can you tell us what that material is and how you attached it to the material to its left? That’s actually tomorrow’s blog post! Thank you for this fantastically video-ed tutorial! I am fascinated by this tambour embroidery you are introducing many of us to. Did I read that you bought a new camera lens for this tambour video? It’s awesome! I’m really looking forward to any future videos of this technique. And do I ever love the netting you are using – so beautiful, even before it is embroidered! Thank-you so much, I have played with tambour but have never managed to get it working well, I keep dropping the thread half way through and the whole lot unravels. I am hopeful that I can now get this technique mastered. One question, my tambour hook has a latch, have you ever tried one of these, or do you have any comments on the pros and cons of tambour hooks with latches? One of the universal truths of many hobbies is that one needs special stuff, oh I know in theory one can knit with any pair of pointy sticks and any yarn like material …. But the process is so much more enjoyable, the outcome more predictable and the result usually more satisfying if one has choice in tools and materials. My bookbinding is very much kitchen table stuff, oh I have a nipping press, and have made a wee clamping press – but the bulk of my tools and materials are those found around the house. Tambour bead embroidery is at the other end of the tool spectrum, starting with a special hooked needle in a special holder – and extending into frames that are able to tension larger pieces of fabric than your average embroidery hoop – not to mention the stands so one can work with both hands free. So far I have invested in several needles and holders, several frames, one set of supports, and a few different fabrics and threads. Those seemed the essentials, the things I needed to be able to tambour. Until now … I worked with materials from my stash, like many I had a selection or is that accumulation of threads and other things that I had acquired over my life as I stitched and sewed, I also had a small selection of beads … acquired when became interested in beads and knitting together. Using a net to illustrate the entry and exit of the hook into the fabric is an absolutely brilliant idea. I am a needlework instructor. I was wondering how I could represent the movement in a photograph or a video. Bom dia, Sou brasileira e estou com grande dificuldade de encontrar essa agulha aui no Brasil. Goostaria de comprá-la .Você poderia me indicar onde comprá-la? Mary, re: Tambour embroidery.. What applications are suitable for tambour stitches considering the ease of removal. An errant ring prong, hangnail, etc could possibly pull one or more stitches out of the embroidery. Thank you. Hi, Laura – Tambour embroidery is used in all kinds of applications, from household linens and decor to clothing (especially couture clothing). When the ends are secure – and assuming you’re using a fairly stable, strong thread – it stands up well to wear and tear. Hi, thanks for the helpful & amazing video.i have a question. Is the tambour embroidery the same as Maggam/Aari work, I mean is that another name of maggam work or they both are different? For the tembour embroidery which thread you are using + can a simple embroidery floss be used for this work? is the needle used for this have sharp hook and can a tambour work be only done on thin fabrics? OK, it’s time for the stupid question…How do you finish the last loop? You can do it two different ways, Ginny – you can take the needle out of the last loop, leaving the loop on the top, and then bring the hook up from underneath and pull that last loop to the back. Then cut the working thread and pull the end through the loop on the back and cinch the loop around the thread end. Or, you can make the last loop and then pull one extra loop through it. Enlarge this extra loop, so that you have about two inches of working thread, cut the thread on the side that leaves you two inches of working thread, and then thread the end of the working thread through a needle and finish the loop just like you would a chain stitch, by tacking down right over the last loop. Is the tambour stitch the same stitch that the Mongolians use to make their chain stitched embroideries? Hi Mary, thank you for the video on tambour embroidery. I’ve not been successful with it though. I keep snagging and catching the cloth rather than the thread. For beginners purpose, what type of fabric would you suggest I use? Tks. I recently got one of these and have been practicing. My main problem is that the hook gets caught in the top loop instead of going through it. Any tips? Where i can bought and the name of the fabric that you used in the tutorial please? Hi Carmen – in this tutorial, I used cotton tulle. I bought it from lacis.com in California, but you can find it in different places online, or sometimes in fabric shops. Just purchased my tambour needles can’t wait to try this technique. Working on a pond scene and this stitch looks like what I was looking for to do the water. I have just started my tambour journey, and your video of the basic stitch is excellent, as all of your videos are. Would you share what fabric you used in the video, as I think the holes in it are perfect for getting the “feel” of the stitch, when pulling the hook up and through, without the dreaded snagging that happens to start off with. Typical of me, posted and then found that you had already answered the question.